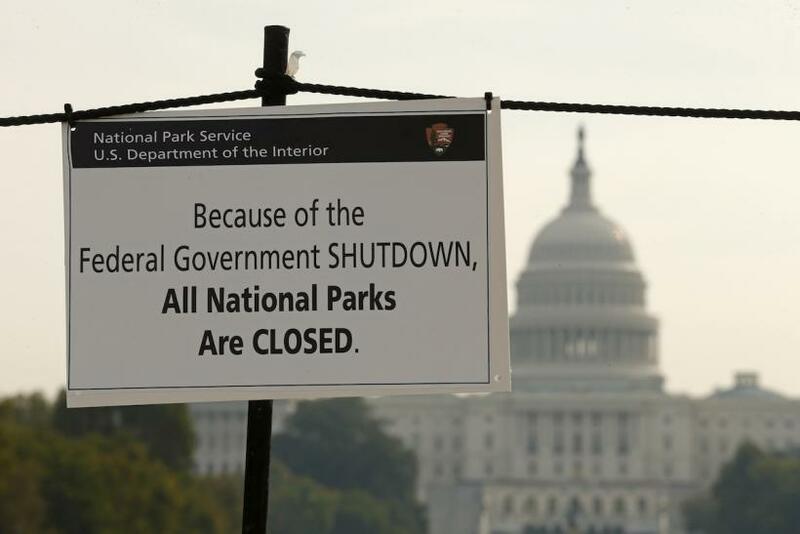 As the partial U.S. government shutdown enters its second week, there seems to be little progress from either the Republicans or the Democrats to end the crippling standoff. After hundreds of thousands of federal workers were sent home, America started to feel the ripple effects, ranging from concerns by federal workers about meeting their financial obligations to local businesses in and around Washington, D.C., losing income. 1. Some European cemeteries are shut. The United States has 20 cemeteries in Europe that hold the remains of about 125,000 fallen soldiers, mostly from the two world wars. The cemeteries that are paid for by the federal government will now remain closed until an agreement can be reached. 2. Some banks are trying their best to help. Federal customers at TD bank received a surprise then the Canadian bank announced that it would give federal employees a $1,000 overdraft facility for free. But after Nov. 2, the recipients must pay it back or face the usual fees. Soldiers at Fort Campbell, Ky., reported seeing people stacking up on meat products because the store would not be stocking once they ran out. There is a Wal-Mart outside of the base, but the meat there is more expensive. 4. How will they keep the Canadians out? Montana shares the second-longest U.S. border with Canada, after Alaska. The 545-mile stretch is now only manned by one person after the remaining people in Commissioner Kyle Hipsley’s Border Patrol team were furloughed. Similar situations exist all along the 5,525-mile border. The Office of Foreign Assets Control has been depleted to the point that it is unable to continue enforcing the sanctions. "Note, our ability to do that, to enforce sanctions, to stop sanction evaders, is being hampered significantly by the shutdown," the agency's head told the Senate Foreign Relations Committee on Thursday. 6. Any events in national parks are off. The Grindstone 100 race that was due to go through the southern Appalachian mountains in West Virginia has had to be called off in what would have been its sixth and biggest year. The race has never been run in less than 17 hours. Cafes and restaurants are offering federal workers free food. Many of the establishments are trying to get rid of leftover food and using up pre-ordered stock. 8. Some museums are actually benefiting. Now that the Smithsonian is shut, federal workers with time on their hands have been visiting other Washington, D.C., institutions that normally don’t get so much traffic. The International Spy Museum has reported a 30 percent increase in visitors over the last week. The National Geographic Museum has experienced a spike, as have the Newseum, the National Building Museum and the Phillips Collection. 9. Cancer cure must wait. The National Institutes of Health has had to turn away cancer patients who volunteer themselves for trials of experimental drugs after other treatments have failed. The Maryland-based institute turned away 200 people in a week. Satirical T-shirts making fun of the shutdown have been generating income for Raygun, a Des Moines, Iowa, T-shirt printer. Founder Mike Draper has sold a couple of hundred every day since the shutdown. Slogans include: "The shutdown 2013 - no productivity, no mercy" and "Furloughed, non-essential employee. Don't ask me, it's my day off."